Imagine what the world would be like if everyone got beer for doing a good deed. Believe it or not, the idea is catching on. Some Brooklyn bars are offering a bloody good deal - donate a pint of blood in exchange for a pint of beer. Cheers to that! Participating pubs like Williamsburg's Spuyten Duyvil and The Brazen Head on Atlantic Avenue are offering the incentive to help increase blood donations this month, The Brooklyn Paper reported. This is great news for anyone who is broke, an alcoholic and likes free stuff. Of course, it could also be a really bad idea should you choose to actually replace pint for pint. 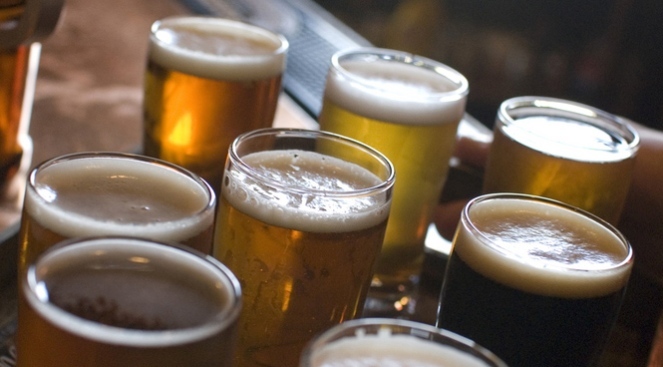 A pint of beer typically gets a 160-pound person's blood-alcohol level up to .03. If that same person donates blood before drinking, the blood-alcohol level would be .04, according to The Brooklyn Paper. The New York Blood Center, which doesn't want to encourage drinking after donating, has asked not to have its name associated with the promotion, according to the Brooklyn Paper. After donating blood, they advise drinking extra glasses of non-alcoholic liquids for the next two days. The blood-for-beer swap may be saving lives - one pint at a time. That's a win-win. Let's just hope no one loses a leg.